We woke up at 8am, ate leftovers in bed, channel surfed uncussessfully and we’re informed that our FedEx package wouldn’t be here until tomorrow. We devised a new plan to buy a synthetic liner that claims to add 25 degrees of warmth. It would be 2 pounds lighter than the heavier sleeping bag so we liked that plan. We then went to the gear store to look for liners for Laurie’s gloves. Still upset with FedEx we didn’t buy anything and went back to the hotel for lunch. At least we ate a lot today. Around 2pm there was a knock on our door. To our surprise it was our package! And there were gloves in it too. Thanks Kathy and Eric. You rock. Andy crawled in the bag and almost immediately started sweating. After a few packing trial runs we decided to keep the heavier sleeping bag. We know that it will keep Andy warm and that reassurance is worth the extra few pounds. The bag fit better in Laurie’s pack so we swapped gear and sleeping bags to make our packs equal weight. This is one of the many benefits of hiking as a couple. Once our decision was made we packed up our trail runners, lightweight gloves, Andy’s sleeping bag and lightweight socks in a box and shipped them to Laurie’s godmother to hold until Sonora Pass or whenever we grow tired of clunky boots. On the way to the post office we ran into more familiar faces. Seems like Lone Pine is the place to be! We chatted with fellow hikers, gave recommendations for restaurants and places to stay (since after being here for 3 days we feel like we know the town well) and caught up on other hikers’ plans and experiences. We made a few calls and organized a ride back to the trail tomorrow morning at 8:30am. The weather has not improved as much as we would have liked but we are restless and ready to hike again. The cold front has passed, winds are more calm, we have plenty of food and if Forester Pass doesn’t seem doable or conditions are unfavorable, we can always turn around. We feel good about our new gear and are more confident heading into snowy conditions with warm sleeping bags and waterproof boots. Around 5pm we ate oatmeal (extra packets we didn’t want to take with us on the trail) for dinner and watched Finding Nemo. It was a very relaxing day. We are ready to be back on the trail. Tonight we are grateful for helpful friends and sweet comments from our readers. Warm and cozy. Let's do this! May your path be the sound of your feet upon the ground:carry o-o-o-o-o-n-n! Just reading about the fair dump of fresh snow. 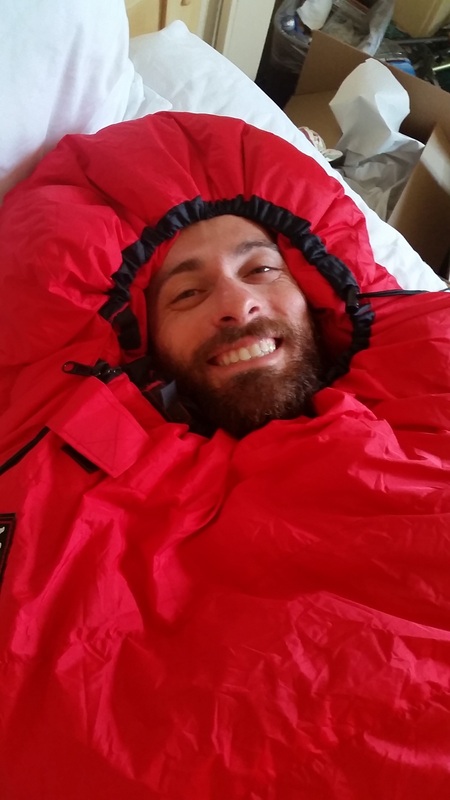 Glad you have all the good gear and that sleeping bag sure looks toasty! Be safe and happy. The blog has been terrific so far. I really appreciate your gratitude practice. ..what a touch! I look forward to more. We think you guys are awesome! Thanks for blogging so regularly I’m sure that isn’t easy. Thanks for your support Jeff and Stella. It isn’t easy but it’s totally worth it! Amazing! We hope to one day follow you. Looking forward to seeing you closer to home and will bring candy and a great bottle of wine! In Tehatchapie due to digestion issues from the trail. It seems like one way or another there are trials with the trail. Ha. Thanks Judy. We hope your son is feeling better and is back on trail! Hi!! I just found this comment. Thank you for that sweet offer- I will keep you posted. We may be heading back into snake country so I want to keep my ears available to hear the rattles! Sounds like a wonderful job at the library- I would love to catch up in person sometime. Hugs!